A site dedicated to the new Audi R10. Fast, sporty, fuel efficient: the Audi R10. AUDI AG is one step ahead of the opposition yet again: The inventor of ‘TDI’ will fight, as the world’s first automobile manufacturer, for overall victory with a diesel powered R10 at the famous 24 Hours of Le Mans. The new Audi R10 is powered by a completely new Audi 5.5-litre, twelve-cylinder bi-turbo TDI engine which is extremely economical and quiet. The Audi R10 Le Mans Prototype, with over 650 hp and more than 1100 Newton metres of torque, significantly exceeds the power produced by the majority of previous Audi racing cars – including that of its victorious R8 predecessor. There are no visual signs that a diesel power unit is at work in the back of the R10. 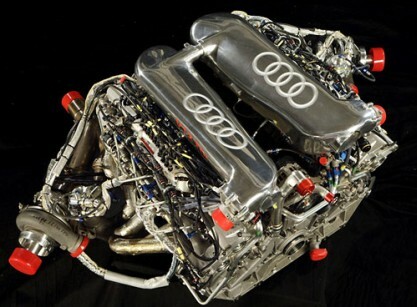 It goes without saying that the V12 TDI is equipped with a pair of diesel particle filters for the 24 Hours of Le Mans. Flashes of flame from the exhaust, which are created by unburned petrol in spark-ignition engines, are not seen coming from the R10. Audi ventures into previously unexplored diesel-engine terrain with the V12 power plant manufactured for the R10 completely from aluminium. The enormous torque of over 1100 Newton metres not only makes extreme demands of the R10 transmission system – as even the Formula 1 specification engine dynamometers at Audi Sport had to be reequipped with special gearboxes capable of withstanding the unusual forces. The Audi badge the 'Four Rings' is the emblem of one of the oldest car manufacturers in Germany. It symbolises the 1932 merger of the four independent motor-vehicle manufacturers: Audi, DKW, Horch and Wanderer. Together with the NSU brand, which joined in 1969, these companies are the roots of the present-day AUDI AG. The Audi Q7 is coming! In March 1994, AUDI AG presented its new model in the premium segment, the Audi A8, at the Geneva Motor Show. This was the first production model with an all-aluminum body. 2003 witnessed the unveiling of the Pikes Peak quattro concept study, a thoroughly Audi take on sport utility. Featuring a 500 hp V8 with race-bred FSI? direct injection technology, Pikes Peak quattro offered the world a first look at the future of the SUV as envisioned by Audi's stellar design team. The Pikes Peak will be seen in production as the Audi Q7. On 13 December 2005, Audi presented the new Audi R10 on a press conference in Paris. Audi is the first automobile manufacturer to fight for overall victory in the 24 Hours of Le Mans with a diesel-powered sportscar – and breaks completely new ground as a result.